This chapter summarizes what we know about value—SWB relations and identifies some of what we do not know but would like to know. We first discuss the nature of values and the structured system they form. 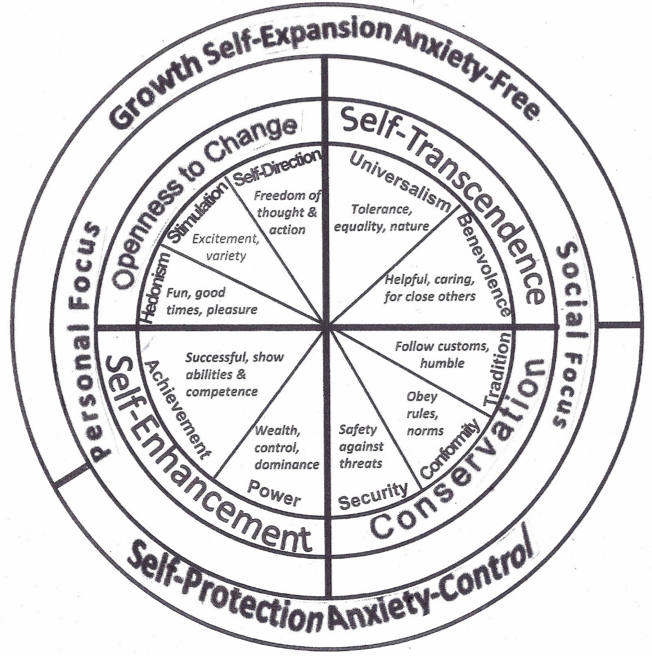 We draw on the ten values in the Schwartz (1992) theory that form a circular motivational continuum. We note three theoretical perspectives on relations of values to SWB. The first perspective seeks to explain direct relations between values and SWB. A second generation of direct relations research explains variation in relations across samples by pointing to societal-level moderators. The second perspective examines the congruence (or similarity) between people’s values and the values prevailing in their environment as a determinant of SWB. The third perspective sees the attainment of valued goals as the source of SWB. We present these perspectives and the literature based on them, and note ideas for future research throughout. Research on relations of personal values to subjective well-being has begun to flourish only recently. This is surprising because our values represent what we consider important and worth pursuing in life, and our subjective well-being (henceforth SWB) represents how happy and satisfied we are with the life we are leading. This chapter summarizes what we know about value—SWB relations and identifies some of what we do not know but would like to know. We first discuss the nature of values and the structured system they form. We then note three theoretical perspectives on relations of values to SWB (Sagiv & Schwartz, 2000; Sagiv, Roccas & Hazan, 2004). The first perspective seeks to explain direct relations between values and SWB. The second examines the congruence (or similarity) between people’s values and the values prevailing in their environment as a determinant of SWB. The third sees the attainment of valued goals as the source of SWB. We present these perspectives and the literature based on them. Throughout, we note ideas for future research. Both psychologists and lay people view values as broad motivational constructs that express what is important to people (e.g., Rohan, 2000; Rokeach, 1973; Schwartz, 1992). Based on their values, individuals perceive acts, objects, people, and events to be more or less desirable (Feather, 1995; Schwartz, 1992). People’s values are central to their identities and concepts of self (Hitlin, 2003; Rokeach, 1973). Are they also related to our sense of well-being? Most theorists agree in defining basic values as desirable, trans-situational goals, varying in importance, that serve as guiding principles in people’s lives (Schwartz, 1992; cf. Kluckhohn, 1951; Rokeach, 1973). Each person holds numerous values (e.g., achievement, security, benevolence) with varying degrees of importance. Schwartz (1992, 2006, 2015) summarized six defining features of basic values found in the literature. (1) Values are beliefs, inextricably linked to affect. (2) Values refer to desirable goals. (3) Values transcend specific actions and situations. (4) Values serve as standards to guide selection and evaluation of people, events, actions, and policies. (5) Values are ordered in a hierarchy by their relative importance. (6) It is the relative importance of the values relevant to any attitude or behavior that motivates and guides that attitude or behavior. The above features characterize all values. What distinguishes one value from another is the type of goal or motivation that the value expresses. Recognizing that every language includes thousands of value terms, researchers have proposed more inclusive basic values for studying value origins and consequences (e.g., Rokeach, 1973). The most popular current classification is from the theory of basic values by Schwartz (1992, 2015). This theory defines ten broad values according to the motivation that underlies each one. We draw on this theory to frame our examination of direct relations between values and SWB. Presumably, the ten values are universal. This is because the values are based on one or more of three universal requirements of human existence: needs of individuals as biological organisms, requisites of coordinated social interaction, and survival and welfare needs of groups. People cannot cope successfully with these requirements of human existence alone. To cope with them, people must articulate appropriate goals, communicate with others about these goals, and gain cooperation in pursuing them. Values are the socially desirable concepts used to represent and communicate these goals. Figure 1 presents the ten motivationally distinct values in the form of a circular continuum. There is a wedge for each value. Values in opposing wedges in the circle conflict with one another motivationally (e.g., stimulation vs. security). Values in adjacent wedges are compatible (e.g., conformity and tradition). Two bi-polar, higher order dimensions summarize the relations among the ten values (Figure 1). Self-transcendence versus self-enhancement describes a conflict between values that express concern for the welfare and interests of others versus values that express concern for one’s own interests above those of others. Openness to change versus conservation describes a conflict between values that emphasize independence of action, thought, and sensations and readiness for change versus security, predictability, and resistance to change. The theory proposes that this circular structure describes the pattern of conflict and compatibility among values across cultures. Research in over 80 countries largely confirms the circular motivational continuum of values (Schwartz, 2017). This suggests a universal organization of human motivations. Figure 1. The circular structure of ten basic values, four higher order values, and two underlying motivational sources (adapted from Schwartz, 2015). The outer two circles in Figure 1 specify two other principles that organize relations among the values. We discuss these principles later in this chapter. There, we cite literature that uses them to explain the associations of values to SWB. Table 1 lists the ten values in their order around the circle. Each is defined in terms of its motivational goal.1 Conceiving values as organized in a circular motivational continuum has an important implication: Any variable that is especially congruent with one basic value (e.g., supporting immigration with universalism) should also be relatively congruent with the adjacent values (benevolence and self-direction) but should conflict with the opposing values (power, security and achievement). As we shall see, this pattern generally holds for associations of values with SWB. Table 1. Ten basic values and their motivational goals. There are three main theoretical approaches to understanding relations between values and SWB. One approach holds that the specific motivational content of a value determines its influence on SWB. This approach postulates that inherent properties of particular values either promote or undermine SWB. That is, some values are ‘healthy’ and others ‘unhealthy’ (Sagiv & Schwartz, 2000; Strupp, 1980). A second approach emphasizes the congruence or similarity between a person’s values and the values prevailing in the environment. A third approach emphasizes the extent to which the environment constrains or facilitates people’s attainment of their valued goals. A third approach emphasizes the effects of successfully attaining valued goals on SWB. We discuss each approach in turn. Theorizing by psychotherapists about value-SWB associations identified values that emphasize autonomy, responsibility, and fairness as healthy and those based on security, conformity, or status needs as unhealthy (Bergin, 1991; Strupp, 1980). Bilsky and Schwartz (1994) were the first social psychologists to identify healthy vs. unhealthy values. Building on Maslow (1943) and Rokeach (1973), they argued that healthy values are cognitive transformations of growth needs and unhealthy values are cognitive transformations of deficiency needs. They classified stimulation, self-direction, universalism, benevolence, and achievement as transformations of growth needs. Success in attaining the goals of these self-actualizing values leads people to attribute more importance to them. They classified conformity, security, and power values as transformations of deficiency needs. Failure to attain the goals of these self-protective values and thereby overcome deprivation and threat leads people to attribute more importance to them. Self-determination theory (Deci & Ryan, 1995; Ryan & Deci, 2001) also links human well-being to the satisfaction of innate psychological needs (see Heintzelman, this handbook). It specifies three needs whose satisfaction promotes well-being: autonomy, competence, and relatedness. These needs are transformed into intrinsic, self-actualizing goals or values. Parallels between the three intrinsic goals and the Schwartz (1992) values are autonomy—self-direction, competence—achievement, and relatedness—both benevolence and universalism (Sagiv & Schwartz, 2000). Self-determination theory also identifies extrinsic goals that derive from the need to obtain other people’s approval, admiration, and praise and to avoid social censure (e.g., financial success, popularity, social dominance). The Schwartz values parallel to extrinsic goals include security, conformity, power, and, perhaps, tradition. Sagiv and Schwartz (2000) noted three mechanisms through which values and SWB may be associated. First, pursuing healthy values may lead to perceptions (e.g. people are kind), attitudes (e.g., tolerance), or behaviors (e.g., helping) that, in turn, increase well-being. Conversely, pursuing unhealthy values may lead to perceptions (people are threatening), attitudes (intolerance), or behaviors (shunning others) that, in turn, undermine well-being. Second, pursuing healthy values may lead directly to well-being because it satisfies intrinsic, self-actualizing needs. In contrast, pursuing unhealthy values does not satisfy intrinsic needs and may require stressful ego-protective activity. These first two mechanisms posit that pursuing particular values causally influences SWB. A third mechanism posits the reverse causal direction, the level of SWB influences value priorities. People who feel safe and satisfied with life have the emotional and cognitive resources to pursue autonomy (self-direction) and excitement (stimulation) and to care for the welfare of close others (benevolence) or society and nature (universalism). People who feel unsafe and threatened, in contrast, are preoccupied with their own problems and lack the resources to pursue these values. They emphasize values whose realization promises greater safety, certainty, and relief from anxiety (security, conformity, tradition, and power). Sagiv and Schwartz (2000) published the first empirical study of associations between the ten values and SWB. They drew upon the above ideas to hypothesize that self-direction, benevolence, universalism, stimulation and achievement values promote SWB and that power, conformity, security, and tradition values to undermine SWB. As the value theory implies, the five values they expected to promote SWB are adjacent in the value circle as are the four values they expected to undermine SWB. They had no expectation for hedonism values, which lie on the boundary between these two sets. Subsequent researchers proposed similar or no hypotheses, simply examining the observed correlations. We found eight studies of direct value-SWB associations in non-representative student or adult samples from seven countries (see Table 2). The SWB index was life satisfaction in most studies and positive affect in a few. Table 2 reveals a consistent, though not perfect, tendency across studies for power values to relate negatively and for benevolence, stimulation, and self-direction values to relate positively to SWB, as hypothesized.2 Hedonism also related positively. Considering only significant findings, there was also a tendency for universalism values to relate positively and conformity values to relate negatively to SWB. Findings for achievement, tradition, and security were inconsistent. These studies offer only partial support for the initial theorizing. Although small sample sizes and cultural differences might account for some inconsistencies, improved theorizing and more rigorous research were clearly needed. Schwartz (2012) and Sortheix and Schwartz (2017) suggested a new theoretical model of direct value-SWB associations. They proposed that relations of values to SWB depend upon the interplay between two motivational underpinnings of values. Every value has a social or a person focus, but it also expresses a self-expansive growth orientation or a self-protective, anxiety-based orientation (Schwartz, 2006, 2015). The self-protection concept improves on the earlier deficiency concept. Self-transcendence and openness to change values express self-expansive, growth orientations. They oppose conservation and power values, which express self-protective, anxiety-control orientations (the top vs. bottom values in the outer circle of Figure 1). Achievement values can be both self-expansive (expressing competence) and self-protective (meeting social standards) as Figure 1 shows. Note. *p <. 05, **p < .01. PO = power, AC = achievement, HE = hedonism, ST = stimulation, SD = self-direction, UN = universalism, BE = benevolence, TR = tradition, CO = conformity, SE = security, SWLS = Satisfaction with life scale, PA = Positive affect, LS = Life satisfaction, PANA = Positive and negative affect, SWB = Subjective well-being (LS and PANA). These authors argued that the growth orientation and the person focus both promote SWB (see Table 3). The growth orientation does so because it motivates self-actualizing, free expression of own ideas, abilities, and feelings (openness to change) and self-expansion to include concern for the welfare of others (self-transcendence). It satisfies intrinsic needs for autonomy and relatedness. The person focus does so because it motivates expression of one’s ideas, abilities, and feelings (openness to change) and the pursuit of personal success and gains (self-enhancement). In contrast, the self-protective, anxiety-control orientation and the social focus both undermine SWB. The self-protective orientation reflects a need to avoid threat and anxiety. It undermines well-being because it motivates subordinating the self to socially imposed expectations (conservation) or asserting control and dominance to overcome anxiety (self-enhancement). It is directed toward extrinsic needs for approval and status. The social focus undermines well-being because it draws attention to needs and problems of others that may arouse concern and worry (self-transcendence) and to social expectations and obligations that limit autonomy (conservation). Table 3. Theorized associations between values and SWB based on crossing two sets of motivations underlying values: growth versus self-protection and person versus social focus. Note: (++) = positive associations; (--) = negative associations; (+-) and (-+) = complex associations (Sortheix & Schwartz, 2017). Based on this theorizing, Sortheix and Schwartz (2017) hypothesized: (a) Openness to change values, which combine a growth orientation and person focus, relate positively to SWB. (b) Conservation values, which combine a self-protection orientation and social focus, relate negatively to SWB. The combinations of orientation and focus that underlie self-enhancement values and self-transcendence values have opposing implications for SWB (see Table 3). For achievement values, Sortheix and Schwartz (2017) expected no direct association with SWB across countries. They anticipated a trade-off between the self-protective interest in the extrinsic goal of approval by others and the person focus on the intrinsic goal of developing one’s competence. They assumed that the opposing implications of the self-protection orientation and the person focus for SWB would be approximately balanced. For power values, they expected a negative association with SWB because the negative implications would outweigh the positive. The self-protection goal of overcoming threats to one’s status implies a sense of anxiety and need to control that may undermine SWB. Moreover, the positive implications of the person focus—free self-expression—would be neutralized by negative implications of pursuing self-interested dominance and wealth. These are extrinsic goals (Ryan & Deci, 2001) whose pursuit increases anxiety (Kasser & Ryan, 1996) and often elicit negative reactions from others. For universalism values, they expected no association with SWB. They assumed that the negative implications of concern for the often-intractable problems of vulnerable out-group members and the wider society (social focus) would neutralize the positive implications of the self-expansive transcendence of personal interests (growth). For benevolence values, they expected a positive association with SWB. They assumed that the negative implications of concern for the welfare of close others (social focus) are offset by its positive outcomes. This concern often motivates actions that promote good relations with family and friends and satisfy relatedness needs (Deci & Ryan, 1995). The positive implications of the self-expansive transcendence of personal interests (growth) should outweigh any weak negative implications of concern for close others (social focus). Sortheix and Schwartz (2017) analyzed representative data from three rounds of the European Social Survey. Multilevel analyses across 35 countries confirmed their expectations for the associations of all ten values with a life-satisfaction index of SWB (Table 2). This supported their theorizing that what determines a value’s association with SWB is its combination of growth- versus protection-orientation and person- versus social-focus. Three recent studies sought to explain variation across samples in the direct relations of values with SWB. These studies introduced contextual variables as moderators that might explain this variation. We present each study in turn. Sortheix and Lönnqvist (2014) analyzed data from 25 representative national samples of the European Social Survey. They drew upon Schwartz’ (1992) distinction between the social and person focus of values. Social-focused values (universalism, benevolence, tradition, conformity and security) primarily regulate how we relate socially to others and affect their interests (on the right in Figure 1). Person-focused values (self-direction, stimulation, hedonism, achievement, and power) primarily regulate how we express personal interests and characteristics (on the left in Figure 1). Sortheix and Lönnqvist (2014) assumed that values’ association to SWB depend on how well values function to help individuals cope with their environment. Different environmental contexts provide different opportunities and impose different affordances or constraints on the successful pursuit of valued goals (Gibson, 1977). They proposed that the level of human development in a country (HDI: affluence, health, and education) moderates direct value—life satisfaction (LS) relations. For social-focused values, Sortheix and Lönnqvist (2014) argued that high HDI contexts (e.g. Norway) provide more resources for and fewer constraints against attaining their goals (e.g., equality, harmony). Moreover, these values motivate prosocial behavior and contribute to social capital and trust (Helliwell & Putnam, 2004; Devos, Spini, & Schwartz, 2002). They further argued that low HDI contexts (e.g., Ukraine) provide few resources for attaining social harmony and constrain people to look out for and protect their own interests and the interests of close others. Sortheix and Lönnqvist (2014) noted two exceptions. They argued that security values are primarily concerned with self-protection, despite their social focus. Moreover, benevolence values express concern for close others that motivates people to help family and friends and promote harmony under all conditions. They hypothesized: (a) In low HDI countries, social focused-values (except benevolence) relate negatively to SWB. (b) In high HDI countries, social-focused values (except security) relate positively to SWB. For person-focused values, Sortheix and Lönnqvist (2014) distinguished between openness to change and self-enhancement values. They noted that openness to change values satisfy autonomy needs and consistently related to higher well-being. They argued that openness to change values motivate behaviors that are especially instrumental for adapting to the difficult and unpredictable living conditions of low HDI environments. They further argued that power and achievement values motivate competitive, self-assertive behavior that conflicts with the values in high HDI contexts but could be especially instrumental for coping with the limited resources in low HDI contexts. They, therefore, hypothesized: (a) Openness to change values relate positively to SWB across countries, but more so in low HDI countries. (b) Self-enhancement values relate negatively to SWB in high HDI countries but positively in low HDI countries. Across all countries, without considering moderation by HDI, Sortheix and Lönnqvist (2014) found that benevolence, self-direction, stimulation, and hedonism related positively to life satisfaction whereas power, security, and conformity related negatively (Table 2). They tested their two moderation hypotheses using the cross-level interactions between HDI and values in predicting SWB. All interactions were significant except for benevolence and hedonism values. They correlated positively with SWB across countries, regardless of HDI levels. In low HDI countries, as hypothesized, the social-focused values (except benevolence) related negatively to SWB. In high HDI countries, as hypothesized, the social-focused values (except security) related positively to SWB, but the universalism and conformity correlations were not significant. Openness to change values related positively to SWB across countries, more so in low HDI countries, as hypothesized. Self-enhancement values related negatively to SWB in high HDI countries, and achievement related positively in low HDI countries. Contrary to the hypothesis, power values related negatively to SWB in low HDI countries. This study demonstrated that the socioeconomic context moderated eight of the ten associations between values and SWB. However, several findings did not fit the theorizing based on the social versus person focus, especially in high HDI contexts. In their study presented above, Sortheix and Schwartz (2017; Schwartz, 2012) also addressed the variation in direct value-SWB associations across countries. They proposed that the cultural values that prevail in a society moderate the associations. Cultural values refer to society’s normative system of value emphases. Specifically, they proposed Cultural Egalitarianism as the critical moderator. This cultural value emphasizes cooperative behavior out of personal choice, thereby preserving the social fabric (Schwartz, 2006, 2014). In egalitarian cultures, people are socialized to engage voluntarily in collaborative, productive work, based on internalized commitments, and to view all people as morally equal. Sortheix and Schwartz (2017) generated moderation predictions by combining an analysis of the cultural context in societies low versus high in Cultural Egalitarianism with the implications of pursuing person-focused versus social-focused values. They asked whether pursuing each basic value might help compensate for what the cultural context fails to provide and whether the cultural context could compensate for what individuals’ values cannot provide. They argued that person-focused values confer an advantage in low egalitarian societies. Such societies provide few resources, so, in order to succeed, individuals must exploit their own capacities and resources and take self-assertive initiatives. This can compensate, at least partially, for what is lacking in the non-supportive and threatening circumstances of low egalitarian societies. They, therefore, hypothesized: In low versus high Cultural Egalitarianism societies, (a) openness to change values relate more positively to SWB and (b) self-enhancement values relate less negatively to SWB. In contrast, pursuing social-focused values is less likely to motivate behavior that can compensate for the instability, uncertainty, and selfishness that characterize low egalitarian societies. Conservation values, grounded in anxiety, are unlikely to motivate the energy, skill, and self-assertiveness to cope with the prevailing difﬁcult circumstances. The needs of others, the concern of self-transcendence values, are liable to be more intense and disturbing in low egalitarian societies. Moreover, these values motivate harmony rather than the assertiveness and competitiveness that can overcome a lack of resources. They therefore hypothesized: In low versus high Cultural Egalitarianism societies, (a) conservation values relate more negatively to SWB and (b) self-transcendence values relate less positively to SWB. Boer (2017) proposed that cultural factors and environmental threats (e.g., disease, wars) may singly or jointly moderate associations of values with affective well-being. She argued that economic, climatic, or safety threats strengthen the associations between affective well-being and the values that protect against threats (e.g., conservation values). Moreover, threat also interacts with culture. Adequate cultural responses to threat (e.g., cultural embeddedness) can diminish the impact of threat on value–well-being associations. Boer (2017) obtained some support for her views, using country as a proxy for the level of threat and of the type of culture. She compared small student samples from four countries. To assess her theorizing requires research that measures threat levels and types of culture directly and uses larger, more representative samples. The second approach to understanding relations of values to SWB emphasizes the extent to which people’s values are congruent with (i.e., similar to) those in their environment, whatever the motivational content of their values. Sagiv and Schwartz (2000) proposed three mechanisms through which person–environment value congruence influences SWB. The first mechanism refers to the opportunities and constraints that the environment affords for goal-attainment. Environmental affordances (Gibson, 1977) are likely to be more favorable to goal-attainment when a person’s values are congruent with those prevailing in the environment. The second mechanism refers to the positive or negative social sanctions likely to be experienced in the environment. When people share similar values, these values take on normative force. Expressing congruent values promotes SWB because others validate them and provide social support. Expressing non-congruent values undermines SWB because others disapprove or even punish. The third mechanism refers to internal value conflict, conflict within one’s own value system that may diminish SWB. This happens if values internalized from the environment contradict the values a person already espouses. The studies of context as a moderator of direct value-SWB associations applied two of these mechanisms to explain moderation effects. These studies hypothesized and tested how variation in aspects of the context (HDI or Cultural Egalitarianism) affected the environmental affordances that constrained or facilitated attaining the goals of particular values. The environmental affordances moderated the associations of those values with SWB. In addition, Sortheix and Schwartz (2017) referred to the social sanctions mechanism to explain why power values relate negatively to SWB regardless of cultural values. Researchers have applied the mechanisms that account for the effects of value-environment congruence on SWB to many environments (e.g., family, friends, organization, profession, and community). We discuss a selection of these. Sagiv and Schwartz (2000) studied congruence between the values of business and of psychology students with the values prevalent in the departments in which they had chosen to study. They assumed that power values are more important than benevolence values in Israeli business schools, but the reverse is true in psychology, an assumption supported in Gandal, Roccas, Sagiv, and Wrzesniewski (2005). As expected, those who endorsed values congruent with the environment had higher well-being. Endorsing power values related positively to SWB among business students, but not among psychology students. Endorsing benevolence values related positively to SWB among psychology students, but not business students. Studies of business students in Singapore (Kasser & Ahuvia, 2002) and Belgium (Vansteenkiste, Duriez, Simons, & Soenens, 2006) did not show the congruence effect, however. These studies measured extrinsic and materialist values in the self-determination theory tradition, not the power value. They found that business students had lower well-being the more importance they ascribed to materialist values. The opposing findings might reflect differences in the index of values, the actual values prevailing in the various business schools, national cultures, or something else. Further research is needed to clarify this. Later studies operationalized value congruence objectively, correlating individuals’ values with their group’s average values. Sortheix and Lönnqvist (2015) found that students in Argentina, Bulgaria, and Finland whose values were more congruent with students in their discipline (psychology or business) had higher life satisfaction and positive affect and lower negative affect. Moreover, value congruence led to better interpersonal relationships, which partially mediated the value congruence - SWB association. In a longitudinal study, Sortheix, Olakivi, and Helkama (2013) found that Finns whose values were more congruent with those of others in their small community had better psychological health. In a Russian national sample, Khaptsova and Schwartz (2016) found greater life satisfaction among those whose values were more congruent with others with similar socio-demographic characteristics (age, gender, education, and ethnicity). Thus, the value congruence effect extended even to an implicit reference group with which one did not interact directly. Numerous organizational studies demonstrate beneficial effects on SWB of sharing values with colleagues or with the organization. For example, perceived compatibility between individual and organizational values was critical in predicting higher work well-being (Leiter & Maslach, 1999). Congruence between personal values and the core values of one´s profession may also protect against poor well-being. Social work is a profession that emphasizes benevolence and universalism values as opposed to power and face (prestige) values (cf. NASW Code of Ethics, 2008). Tartakovsky (2016) found that the more social workers endorsed benevolence and universalism values and the less they endorsed power and face values, the less exhaustion and burnout they experienced. Research using difference scores and profile correlations to measure value congruence found that Israeli couples’ overall value similarity correlated with their relationship satisfaction (Gaunt, 2006). A study of Finnish couples examined similarity on each of the ten values separately (Leikas, Verkasalo, Ilmarinen, Vartiainen, & Lönnqvist, 2017). The relationships between value similarity and relationship satisfaction depended on gender. For men, similarity with their spouse in self-direction values related positively to satisfaction. For women, similarity with their spouse in conformity values related negatively to satisfaction. For both men and women, similarity with their spouse in hedonism values related positively to satisfaction. However, value similarity mattered less for couples’ satisfaction than similarity in political attitudes and religiosity, variables that are influenced by underlying values (Leikas et al., 2017). If individuals strongly identify with the society in which they live, we might expect that congruence between their values and those in the society would affect SWB. Zilberfeld (2010) assessed this possibility in a study of ultra-orthodox students in Israel. Ultra-orthodox society emphasizes the embeddedness of the person in the group and rejects autonomous thought and action. As expected, SWB correlated positively with endorsing conformity values and negatively with endorsing self-direction values. This pattern of correlations did not replicate among students from the wider Israeli society that does not share the same cultural value emphases. On the broader societal level, however, there is little support for the hypothesis that similarity between individuals’ values and those of their country promotes SWB. Schwartz (2012) tested this hypothesis with data from representative samples from 32 European Social Survey countries. Contrary to the hypothesis, congruence with the average value in the country increased the negative correlations of conservation values with SWB and decreased the positive correlations of openness to change values with SWB. Research on cultural estrangement also questions the positive role of congruence between individuals’ values and those in their society. Cultural estrangement is the inverse of congruence. It refers to the discrepancy between personal values and perceived societal values (Bernard, Gebauer, & Maio, 2006). The congruence hypothesis would predict a negative association between cultural estrangement and mental health indicators. However, Bernard et al. (2006) found no association between value discrepancies and psychological outcomes. Perhaps value congruence with one’s society enhances SWB only when individuals are aware of the prevailing cultural values and identify strongly with the society. This is a topic for future research. A problem overlooked in some similarity studies is that apparent similarity effects may be due to the value scores of the individuals and/or groups compared. To uncover unique effects of similarity requires first controlling for the actual value scores. Such controls may eliminate similarity effects (e.g., Dyrenforth, Kashy, Donnellan, & Lucas, 2010) or leave them unchanged (e.g., Khaptsova & Schwartz, 2016; Sortheix & Lönnqvist, 2015). This third approach is concerned with the process through which values lead to SWB. It proposes that the link between a value and SWB depends upon the successful attainment of the goals the value motivates a person to pursue. Unlike the healthy values approach, it does not assume that holding particular values (e.g., self-direction) is conducive to SWB. Rather, it assumes that people experience high SWB to the extent they attain the goals they. Some evidence suggests that simply attaining a valued goal is sufficient to enhance SWB (e.g., Oishi, Diener, Suh, & Lucas, 1999). Other evidence suggests that the effect on SWB depends on the nature of the goal that is attained (e.g., Sheldon & Kasser, 1998). In a study by Oishi et al. (1999), students reported daily for 23 days how satisfied they were with their achievements and their social life. They also reported whether it was a good or bad day. Subsequently, they completed a measure of the importance they ascribe to the ten basic values. Students’ goal attainment (indicated by their daily satisfaction with their achievements and social life) predicted their daily well-being. Except for achievement, their values did not (Table 2). But their values did moderate the effect of goal attainment. Satisfaction with achievements predicted well-being more strongly for those high in achievement values than for those low in achievement values. Likewise, satisfaction with their social life predicted well-being more strongly for those high in benevolence values than for those low in benevolence values. Another analysis showed that various activities were more or less satisfying to the extent that they were consistent with individual’s important values (Oishi et al. 1999). For example, the more people valued power, the more satisfaction they gained from performing power-related activities (e.g., buying expensive clothes). Findings were similar for the effects of achievement, universalism, benevolence, and stimulation/hedonism values on the satisfaction gained from their related activities. Moreover, the more importance individuals attributed to a value, the less satisfaction they gained from activities related to the values on the opposite side of the value circle. For example, the more people valued universalism, the less satisfaction they gained from power-related activities. The third analysis in Oishi et al. (1999) showed that values also moderated relations between satisfaction in particular life domains and global life satisfaction. For example, satisfaction with grades related more strongly to life satisfaction the more important achievement values. In sum, values led to increased SWB when the goals they motivated were successfully attained. This process applied to all values in Oishi et al. (1999). However, other research suggests that not all goal attainment is beneficial for SWB. Most of this research is grounded in self-determination theory and does not measure the ten basic values explicitly, but we can nonetheless extrapolate from it. In three studies of adolescents and young adults, Kasser and Ryan (1993) examined associations of individuals’ aspirations with various indexes of well-being. Aspirations for financial success (i.e., power values) related negatively to well-being, fitting the healthy values expectation. Significantly for the goal attainment approach, anticipating attainment of the desired financial success also led to poorer well-being. In a diary study of students, Sheldon and Kasser (1998) examined whether students’ goal progress during a semester promoted their well-being. Those who made more progress toward their goals experienced increased SWB over time. However, this occurred only if the goals they pursued were high in self-determination and/or in intrinsic orientation. Such goals largely express growth values. Attaining extrinsic (power-related) goals did not affect SWB. Kasser and Ryan (2001) reported similar findings. They found that attainment of intrinsic goals related to increased well-being, but the attainment of extrinsic goals did not. The different outcomes of attaining achievement and power-related goals in Oishi et al. (1999) and the research based on the self-determination theory discussed above (see also, Kasser & Ahuvia, 2002; Vansteenkiste et al., 2006) points to the need for further research. Such research could measure both the ten basic values and the intrinsic/extrinsic values explicitly. It could identify the circumstances under which each value motivates goals whose attainment does or does not promote SWB. It would also be instructive to examine relations between the ten basic values and people’s intrinsic and extrinsic aspirations. A clear message of this chapter is that value-SWB associations vary across contexts. We saw that both a socioeconomic (HDI) and a cultural (Cultural Egalitarianism) characteristic of societies moderated these associations. Other potential societal moderators also merit investigation. For example, researchers might consider levels of democracy, social expenditure, corruption, and rural/urban differences, on the one hand, and cultural values like embeddedness, hierarchy, and harmony, on the other. Studies in non-Western societies might reveal other patterns of moderation. Theoretical analyses could suggest how espousing each value might enhance or undermine successful coping with the environmental demands, constraints, opportunities, and sanctions associated with variation on potential moderators. Less research attention has been paid to characteristics of individuals that may moderate value-SWB associations. One potential moderator for which there is some support is people’s social identities (Sagiv, Roccas, & Oppenheim-Weller, 2015). Identities provide different opportunities and constraints for attaining valued goals. Whether particular values are likely to promote SWB may depend, therefore, on which of a person’s social identities he or she is enacting. For example, endorsing power values may enhance SWB for a person when enacting her manager identity but undermine SWB when enacting her friend identity. Identities may also mediate relations of values to SWB. Espousing values consonant with a social identity (e.g., self-direction values, but not conformity values, with an artist identity) may enhance SWB by validating the identity. Links between values, identities, and SWB are a fruitful domain for future research. Studies of self-esteem suggest that internal conflict or confusion between the values one espouses in different contexts may also damage SWB (e.g., Daniel, Boehnke, & Knafo-Noam 2016). No research we found treated age or gender as possible moderators of value-SWB associations. We analyzed data from the representative samples from 27 countries in the first three rounds of the European Social Survey to assess whether considering these ubiquitous individual characteristics might be worthwhile. We categorized age into four groups: 15-29, 30-45, 45-65, and 65+ years. Correlations of values and SWB revealed monotonic trends across age groups for eight of the ten values. With increasing age, openness to change values correlated more positively with SWB, whereas conservation and self-enhancement values correlated more negatively. Although these findings are based on cross-sectional data, they suggest that theorizing about why age acts as a moderator assessing possible explanations is worthwhile. Findings for gender also revealed significant moderation. Openness to change and self-transcendence values correlated more positively with SWB among women than among men, whereas conservation and power values correlated more negatively. So, moderation by gender also deserves further study. Taken together, two cross-national studies suggest that emotions may mediate relations of values to SWB. One study revealed that people’s values influence the emotions they desire to feel (Tamir, et al. 2016). For example, people who endorse benevolence values want to feel more empathy or love and people who endorse power values want to feel more anger or hatred. The second study (Tamir, Schwartz, Oishi, & Kim, 2017) found that people who experience the emotions they desire to experience, whether pleasant (e.g., empathy or love) emotions or unpleasant (e.g., anger or hatred) emotions, are happier. Thus, people are happier the more they experience the emotions that their own values promote, whatever the content of their values. We found only one study that examined both values and personality traits together as predictors of SWB. Haslam, Whelan, and Bastian (2009) found that one or more Big 5 traits fully mediated relations of four values to SWB in a sample of Australian students. For example, extraversion mediated relations of stimulation and self-direction with SWB. Further studies should examine joint effects of values and traits in larger and more representative samples. Might there be additive effects? Or might they interact in their effects on SWB? Throughout this chapter, we have spoken of relations or associations between values and SWB. Long-term longitudinal studies are required to establish whether value change affects subsequent change in SWB and/or vice versa. Because values change quite slowly and only in response to major changes in life conditions whereas SWB is more volatile, it seems more plausible to expect causality to flow primarily from values to SWB. Three studies by Kasser et al. (2014) examined change in SWB and materialism values (related to power value) in different age groups and cultures. In all three studies, decreases in materialism values led to increased SWB whereas increases in materialism lead to decreased SWB. Moreover, changes in well-being predicted changes in materialism. The SWB to materialism effect was weaker, as our reasoning suggests, but it does indicate some reciprocal causality. Experimental studies have examined causality in short-term relations between various types of well-being and materialism values. Some primed materialist values and observed the impact on well-being (e.g., study 4 in Kasser et al., 2014), others manipulated well-being and observed the impact on state materialism (e.g., Solberg, Diener, & Robinson, 2004). The findings support reciprocal causality between values and SWB. These studies all examined materialism values. It is important to study value-SWB causality for other values both longitudinally and experimentally. The strength and direction of causality between values and SWB may depend upon the specific values in question. In reviewing the various studies, we have not distinguished among different aspects of SWB. Although values usually relate to most aspects of SWB similarly, there may be some systematic differences worth studying. For example, social well-being, defined as a sense of integration, cohesion, acceptance, and contribution to society (Keyes, 1998), correlated positively with conformity and negatively with self-direction among Iranian students (Joshanloo & Ghaedi, 2009). These findings may reflect unique characteristics of this sample or of Iran. However, it also possible that the relationships of conformity and self-direction values to the social aspects of SWB differ from relations to other aspects of SWB in some conditions. The studies of value-SWB associations we reviewed investigate satisfaction with life, happiness, and positive and negative affect. These SWB indicators correlate positively with meaning in life, but the association is far from perfect (Baumeister, 1991; Oishi & Diener, 2014). Meaning is an important aspect of well-being. Research on relations of the basic values to meaning in life and on the environmental and individual characteristics that moderate them would provide an important addition to our understanding of how values affect the quality of life. We have focused on the ten basic values identified by Schwartz (1992). Recent theorizing and research (Schwartz et al., 2012; Schwartz, 2017) has refined these values and introduced two others (humility and face) that are recognized across cultures that may yield worthwhile new insights. National levels of SWB have become a tool to evaluate the progress of countries and to inform public policy (Diener, Lucas, Schimmack, & Helliwell, 2009). Most countries with the highest levels of SWB are in Scandinavia and West-Europe (Helliwell, Layard, & Sachs, 2012). These countries provide a favorable context of high Cultural Egalitarianism and socio-economic level. Countries with low levels of SWB tend to be low in Cultural Egalitarianism and socioeconomic level. Our findings imply that change in basic values would have different consequences for national SWB in more versus less favorable contexts. Increased emphases on self-transcendence and conservation values may enhance SWB in favorable contexts but may weaken SWB in unfavorable contexts. Increased emphases on self-enhancement values may weaken SWB in favorable contexts, but in less favorable contexts, achievement values could even enhance SWB. It is, therefore, necessary to consider the context when anticipating the kinds of value change that may help to improve people’s well-being. The literature reviewed here suggests that some values are healthier than others, though not under all circumstances. Theorizing based on combining the social- versus person-focus and the growth versus self-protection orientation of values explains direct value-SWB associations well. However, these associations vary across context. The context may refer to family, friends, neighborhood, organization, demographic peers, society, and more. Sharing values (congruence) with those in close social contexts enhances SWB. In both close and broad societal contexts, the opportunities and constraints the environment provides for attaining valued goals moderate value-SWB associations. We can understand variation across cultures and countries in the associations of particular values with SWB by identifying characteristics of the context that promote or block attainment of these values. With the recent flourishing of research on value-SWB relations, we anticipate many new insights. 1Recently, Schwartz and colleagues (Schwartz, et al. 2012; Schwartz, 2017) split the same circle into 19 more narrowly defined values in their refined value theory. 2We discuss the exceptions for business and psychology students in Sagiv and Schwartz (2000) below, under ‘value-environment congruence’. 3This study also examined associations between values and depressive affect. Hypotheses were the mirror opposite of those for life satisfaction. All main effect hypotheses were confirmed. Cultural Egalitarianism moderated the associations with depressive affect for only four values in the predicted manner, however. Bernard, M. M., Gebauer, J. E., & Maio, G. R. (2006). Cultural estrangement: The role of personal and societal value discrepancies. Personality and Social Psychology Bulletin, 32, 78-92. Bilbao, M. A., Techio, E. M., & Paez, D. (2007). Felicidad, cultura y valores personales: Estado de la cuestión y síntesis meta-analítica. [Happiness, culture and personal values: Current situation and meta-analytic synthesis]. Revista de Psicología –Lima, 25, 223–276. Bilsky, W., & Schwartz, S.H. (1994). Values and personality. European Journal of Personality, 8, 163-181. Bobowik, M., Basabe, N., Páez, D., Jiménez, A., & Bilbao, M. Á. (2011). Personal values and well-being among Europeans, Spanish natives and immigrants to Spain: Does the culture matter? Journal of Happiness Studies, 12, 401-419. Boer, D. (2017). Values and affective well-being: How culture and environmental threat influence their association. In S. Roccas & L. Sagiv (Eds. ), Values and behavior: Taking a cross-cultural perspective. Daniel, E., Boehnke, K., & Knafo-Noam, A. (2016). Value-differentiation and self-esteem among majority and immigrant youth. Journal of Moral Education, 45, 338-353. Deci, E. L., & Ryan, R. M. (1995). Human autonomy. In Efficacy, agency, and self-esteem (pp. 31-49). US: Springer. Devos, T., Spini, D., & Schwartz, S. H. (2002). Conflicts among human values and trust in institutions. British Journal of Social Psychology, 41, 481-494. Diener, E., Lucas, R., Schimmack, U., & Helliwell, J. (2009). Well-being for public policy. New York: Oxford University Press. Dyrenforth, P. S., Kashy, D. A., Donnellan, M. B., & Lucas, R. E. (2010). Predicting relationship and life satisfaction from personality in nationally representative samples from three countries: The relative importance of actor, partner, and similarity effects. Journal of Personality and Social Psychology, 99, 690-702. Feather, N. T. (1995). Values, valences, and choice: The influence of values on the perceived attractiveness and choice of alternatives. Journal of Personality and Social Psychology, 68, 1135-1151. Gandal, N., Roccas, S., Sagiv, L., & Wrzesniewski, A. (2005). Personal value priorities of economists. Human Relations, 58, 1227-1252. Gaunt, R. (2006). Couple similarity and marital satisfaction: Are similar spouses happier?. Journal of Personality, 74, 1401-1420. Gibson, J. J. (1977). The theory of affordances. In R. Shaw & J. Bransford (Eds. ), Perceiving, acting, and knowing: Toward an ecological psychology (pp. 67-82). Hillsdale, NJ: Lawrence Erlbaum. Helliwell, J. F., & Putnam, R. D. (2004). The social context of well-being. Philosophical Transactions of the Royal Society B: Biological Sciences, 359(1449), 1435. Hitlin, S. (2003).Values as the core of personal identity: Drawing links between two theories of self. Social Psychology Quarterly, 66, 118–137. Joshanloo, M., & Ghaedi, G. (2009). Value priorities as predictors of hedonic and eudaimonic aspects of well-being. Personality and Individual Differences, 47, 294-298. Karabati, S., & Cemalcilar, Z. (2010). Values, materialism, and well-being: A study with Turkish university students. Journal of Economic Psychology, 31, 624-633. Kasser, T., & Ahuvia, A. (2002). Materialistic values and well‐being in business students. European Journal of Social Psychology, 32, 137-146. Kasser, T., Rosenblum, K. L., Sameroff, A. J., Deci, E. L.,….Hawks, S. (2014). Changes in materialism, changes in psychological well-being: Evidence from three longitudinal studies and an intervention experiment. Motivation and Emotion, 38, 1-22. Kasser, T. , & Ryan, R. M. (1993). A dark side of the American dream: Correlates of financial success as a central life aspiration. Journal of Personality and Social Psychology, 65, 410-422. Kasser, T., & Ryan, R. M. (2001). Be careful what you wish for: Optimal functioning and the relative attainment of intrinsic and extrinsic goals (116-131). In P. Schmuck and K. M. Sheldon (Eds. ), Life goals and well-being: Towards a positive psychology of human striving. Lengerich, Germany: Pabst Science. Keyes, C. L. M. (1998). Social well-being. Social Psychology Quarterly, 61 (2), 121-140. Khaptsova, A., & Schwartz, S. H. (2016). Life satisfaction and value congruence: Moderators and extension to constructed socio-demographic groups in a Russian national sample. Social Psychology, 47, 163-173. Kluckhohn, C. (1951). Values and value‑orientations in the theory of action: An exploration in definition and classification. In T. Parsons & E. Shils (Eds. ), Toward a general theory of action (pp.388‑433). Cambridge, MA: Harvard University Press. Leikas, S., Verkasalo, M., Ilmarinen, V.-J., Vartiainen, H.L. and Lönnqvist J.-E. (2017). Couple satisfaction and similarity of personality traits, personal values, and attitudes. Manuscript submitted for publication. Leiter, M. P., & Maslach, C. (1999). Six areas of work life: A model of the organizational context of burnout. Journal of Health and Human Services Administration, 21, 472-489. NASW Code of Ethics (2008). Retrieved from: https://www.socialworkers.org/pubs/code/code.asp. Oishi, S., Diener, E., Suh, E., & Lucas, R. E. (1999). Value as a moderator in subjective well-being. Journal of Personality, 24, 1319–1331. Oishi, S., Schimmack, U., Diener, E., & Suh, E. M. (1998). The measurement of values and individualism-collectivism. Personality and Social Psychology Bulletin, 24, 1177–1189. Rohan, M. J. (2000). A rose by any name? The values construct. Personality and Social Psychology Review, 4, 255–277. Sagiv, L., Roccas, S., & Hazan, O. (2004). Value pathways to well‐being: Healthy values, valued goal attainment, and environmental congruence. In P.A. Linley & S. Joseph (Eds. ), Positive psychology in practice (pp. 68–85). Hoboken, NJ: Wiley. Sagiv, L., Roccas, S., & Oppenheim‐Weller, S. (2015). Values and well-being. In S. Joseph (Ed. ), Positive psychology in practice: Promoting human flourishing in work, health, education, and everyday life, second edition (pp. 103–120). New Jersey: Wiley. Schwartz, S. H. (1992). Universals in the content and structure of values: Theory and empirical tests in 20 countries. In M. Zanna (Ed. ), Advances in experimental social psychology (Vol. 25) (pp. 1-65). New York: Academic Press. Schwartz, S. H. (2006). Les valeurs de base de la personne: Théorie, mesures et applications [Basic human values: Theory, measurement, and applications]. Revue Française de Sociologie, 47, 249-288. Schwartz, S. H. (2012, November). Do personal values underlie or undermine happiness? Cultural effects. Paper presented at the European Social Survey International Conference, Nicosia, Cyprus. Schwartz, S. H. (2014). National culture as value orientations: Consequences of value differences and cultural distance. In V. Ginsburgh & D. Throsby (Eds. ), Handbook of the economics of art and culture, vol.2 (pp. 547-586). Elsevier/North Holland. Schwartz, S. H. (2017). The refined theory of basic values. In S. Roccas & L. Sagiv (Eds. ), Values and behavior: Taking a cross-cultural perspective (pp. 51-72). Cham, Switzerland: Springer International Publishing. Schwartz, S. H., Cieciuch, J., Vecchione, M., Davidov, E., Fischer, R., Beierlein, C., ... & Dirilen-Gumus, O. (2012). Refining the theory of basic individual values. Journal of Personality and Social Psychology, 103(4), 663. Solberg, E. G., Diener, E., & Robinson, M. D. (2004). Why are materialists less satisfied?. In T. Kasser, and A. Kanner (Eds.). Psychology and consumer culture: The struggle for a good life in a materialistic world (pp. 29—48). Washington, DC: American Psychological Association. Sortheix, F. M., & Lönnqvist, J. E. (2014). Personal value priorities and life satisfaction in Europe: The moderating role of socioeconomic development. Journal of Cross-Cultural Psychology, 45(2), 282-299. Sortheix, F. M., & Lönnqvist, J. E. (2015). Person‐group value congruence and subjective well‐being in students from Argentina, Bulgaria and Finland: The role of interpersonal relationships. Journal of Community & Applied Social Psychology, 25(1), 34-48. Sortheix, F. M., Olakivi, A., & Helkama, K. (2013). Values, life events, and health: A study in a Finnish rural community. Journal of Community & Applied Social Psychology, 23(4), 331-346. Sortheix, F. M., & Schwartz, S. H. (2017). Values that underlie and undermine well‐being: Variability across countries. European Journal of Personality, 31(2), 187-201. Strupp, H. H. (1980). Humanism and psychotherapy: A personal statement of the therapist's essential values. Psychotherapy, 17, 396-400. Tamir, M., Schwartz, S. H., Cieciuch, J., Riediger, M., Torres, C., Scollon, C., Dzokoto, V., Zhou, X., & Vishkin, A. (2016). Desired emotions across cultures: A value-based account. Journal of Personality and Social Psychology, 111, 67-82. Tamir, M., Schwartz, S. H., Oishi, S., Kim, M. Y. (2017). The secret to happiness: Feeling good or feeling right? Journal of Experimental Psychology: General, 146(10), 1448-1459. Tartakovsky, E. (2016). Personal value preferences and burnout of social workers. Journal of Social Work, 16(6), 657-673. Vansteenkiste, M., Duriez, B., Simons, J., & Soenens, B. (2006). Materialistic values and well‐being among business students: Further evidence of their detrimental effect. Journal of Applied Social Psychology, 36(12), 2892-2908. Zilberfeld, T. (2010). Person-culture fit and subjective well-being among ultra-orthodox and secular Israelis. Unpublished master’s thesis, Hebrew University, Jerusalem, Israel.